Heat oven to 350°F. Lightly grease 12-cup fluted tube or Bundt pan with butter or cooking spray. 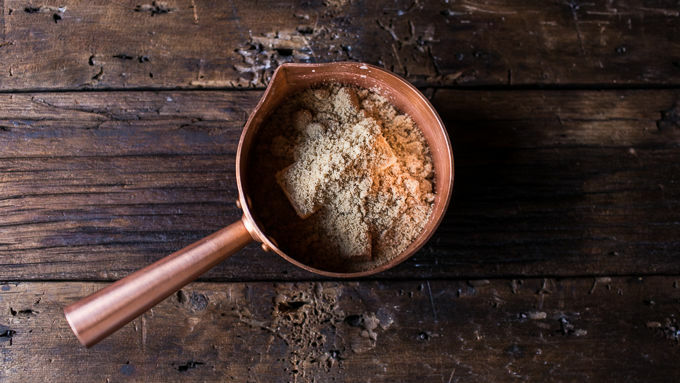 In large gallon-size storage food bag or large bowl, mix the granulated sugar and cinnamon. Separate the biscuit dough into 16 biscuits (8 biscuits per can); cut each biscuit into quarters, making 32 pieces. Break each of the Andes™ Mint bars into 4 pieces. Working with one biscuit quarter at a time, flatten the quarter into a circle shape. 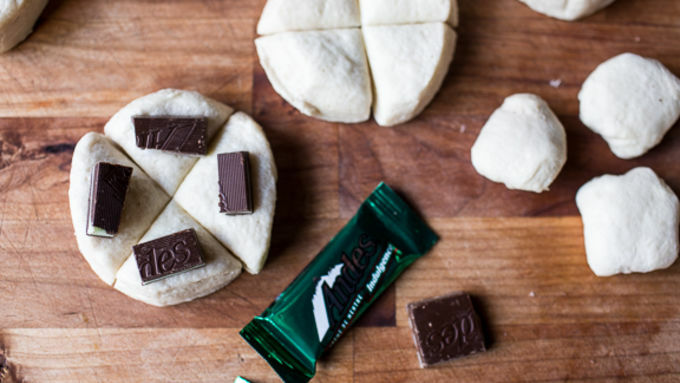 Place one piece of mint chocolate (or a few chips) in the center of the dough. Bring the edges of the dough up and over the filling, stretching the dough as necessary to encase the fillings in the middle of the dough ball. Repeat with remaining dough circles. 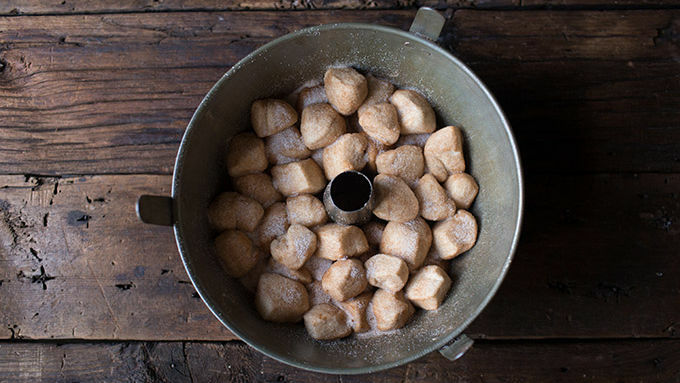 Add the filled dough balls a few at a time to the bag (or bowl) of cinnamon sugar. Shake in the bag to coat the dough. Arrange covered dough balls in the prepared pan. In a small bowl, mix the brown sugar and melted butter; pour mixture over biscuit pieces. Place the pan on a baking sheet. Bake 30 to 35 minutes or until golden brown and no longer doughy in the center. Remove from the oven and carefully invert the pan onto a serving plate. Allow the bread to cool inverted in the pan for 10 minutes. Meanwhile, melt the Andes™ Mint baking chips or pieces in the microwave until melted and smooth, about 1 minute, stirring every 15 seconds. Remove the pan and drizzle the melted chocolate over the bread. Pull apart to serve. Serve warm and dust with sprinkles if desired. For a fun flavor switch up, try replacing the Andes™ Mint bars with your favorite chocolate bars. 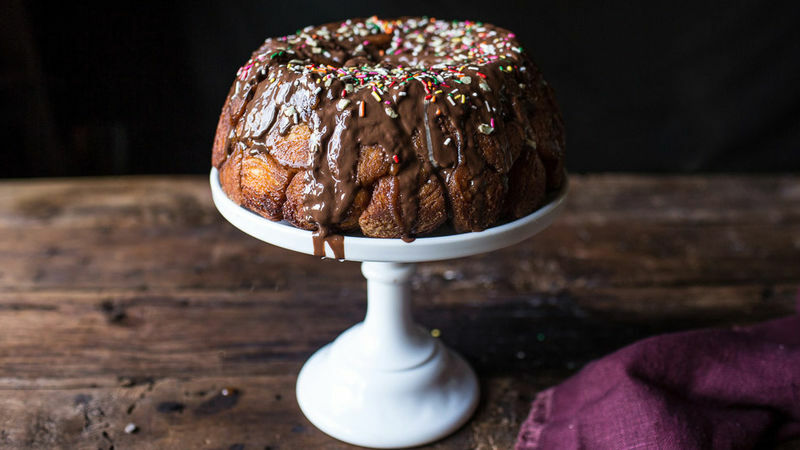 Just when you thought monkey bread couldn’t get any better… it did! 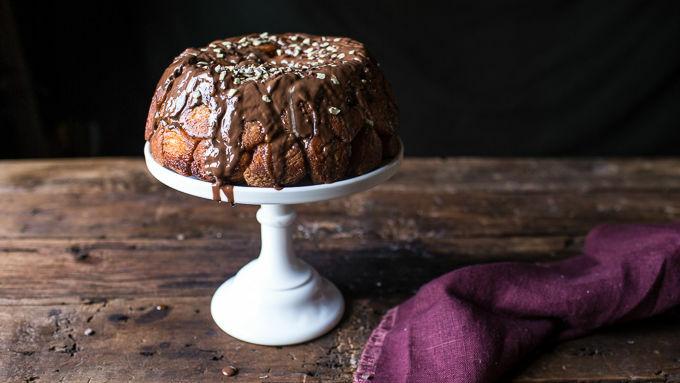 Because chocolate + mint = Andes™… and Andes™ in monkey bread—WHOA! This is going to be good. I don’t know about you, but in my house, breakfast monkey bread is a tradition. My mom has been making monkey bread for Christmas since I can remember. It’s a ritual that I don’t plan on breaking anytime soon. I mean, why would I? Monkey bread is the BEST. This year I thought it would be fun to change things up a bit and make a minty chocolate version of my mom’s monkey bread for Thanksgiving morning. This bread will be great to hold everyone over until the big feast. If your guests aren’t arriving until later (or better yet, you’re going to feast somewhere else), prep the bread on Turkey Day and then simply pop in the oven the next morning. It’s perfect for serving to out-of-town guests. OR… if you didn’t serve the feast… as a kind of a consolation for not having any leftovers. Serve warm and dust with sprinkles if desired.